The weather is so nice I may vote twice! DO REMEMBER: Don't procrastinate, don't prevaricate - prognosticate! NY Met marketing mavens are no doubt wondering how to tie the Amazin's to the Amazons. Typepad is now running over HTTPS. If you are getting a security error on your custom domain, go to Account > Domain Mapping. After loading the page, wait about five minutes, and your domain should be fixed. Still not working? Open a help ticket. I wouldn't guess that a typical account profile is part of a "custom domain" but then again, maybe the transition to higher security has created more glitches than they imagined. Of course, the site will be totally secure if no one can access it, so there's that. I was pleasantly surprised when the person checking me off the voter list read my name off of my driver's license rather than asking me for it. Well, there is a silver lining in this election. 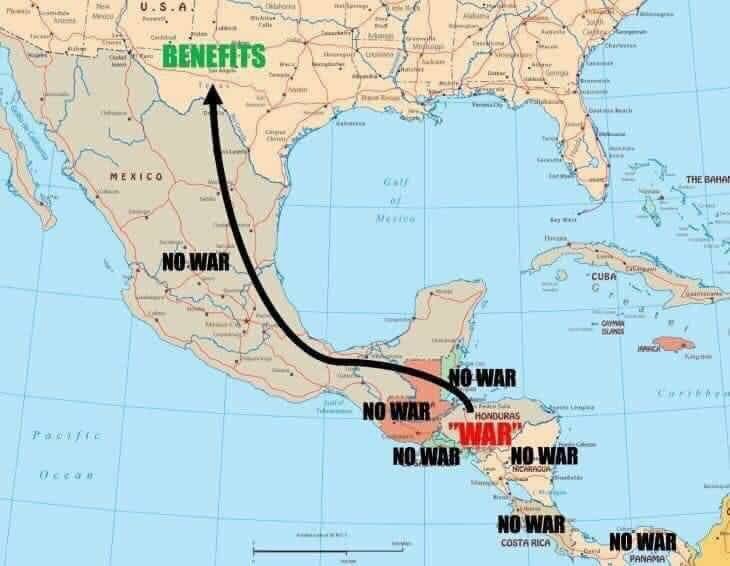 The caravan will not be here on time to vote. Someone was taking names at the polling place entrance. I declined to give mine, but I suppose it was a get out the vote tally. Tom Bowler,who do you think will win the Edwards/Pappas race in NH? Edwards would be the first AA in NH to win a congressional seat,I think. The Dem current AG in Maine will probably win because of LePage fatigue. The 2nd district will probably remain Republican. As far as Florida,who knows? I'm in Pennsylvania (it's pouring), so my district is new, redrawn by the Dems and the Supremes won't hear the case. My GOP congressman, Scott Perry, is definitely in danger in this new district, and has been clearly outspent. Until this morning, my polling place was on the next corner, literally a 30 second walk. Now, there is still a polling place there, but it's no longer mine - mine is eight blocks away! Long lines shown on Fox from Carmel, Indiana - northern Indy suburbs. Great to see that Elliot, Tom Bowler, Buford Gooch and paladin2 were back and posting last night/this morning. Also great to see 'Ms. Scarlett' - a self-described long time lurker - posting yesterday. I don't really know, Marlene. New Hampshire went blue last time, electing two Dem Senators and two Dem Congresswomen, probably on Hillary's coattails. In one of the previous threads somebody linked a prognosticator who predicted the Republicans will hold the House, but in that analysis they did not project a winner in either New Hampshire House race. Toss up, I guess. On another topic, Marlene. As I recall you said your folks bought a place up in Colebrook years ago. Did you spend any time there? Rep. Adam Schiff (D-CA) told the Los Angeles Times Monday that the investigation into so-called “Russian collusion” with President Donald Trump’s 2016 presidential campaign will be a top priority if Democrats win the midterm elections. He vowed to go after Trump’s personal business interests: ““The president has sought to keep that off limits, but if that’s the leverage Russians pose that’s a real threat to our country,” Schiff said, as quoted by the Times. if you started seeing vulgar comments above "jimmyk" and the same avatar you have now, you'd understand why Ignatz, I and probably some others did it. Ok, that makes sense, but I think a lot more people did it who were not getting socked. I guess I'm just instinctively leery about registering for anything if I can avoid it. Though I do favor registration here if it can be made to work as simply as it does over at Althouse. I just hope control of the House doesn't hang in the balance over a few recounts, because we know what happens in those cases: Mysterious boxes of ballots with D votes are suddenly discovered in a closet. CNN: Bitter Clingers Holding onto Their Bibles Not Respecting Separation of Church and State at Trump Rally. Crowd sings "Nazi battle anthem" as womxn clings to life. This is CNN. He said that the kiss happened in the bedroom of a house which was about a 15-to 20 minute walk from the Van Ness Metro, that Dr. Ford was wearing a swimsuit under her clothing, and that the kissing ended when a friend jumped on them as a joke. [Redacted] said that the woman initiated the kissing and that he did not force himself on her. Ken Danieli again:In 2014, RealClearPolitics labeled 30 House seats as "Toss Ups." -- Too close to call at the end. Republicans won 70% of those seats, Dems 30%. In 2016, it was 20 Toss Ups. GOP won 80% of those seats, Dems 20%. In 2018, RCP has 38 Toss Ups, more than the prior two cycles, declaring 1 out of every 11 House Races "too close to call." From the last thread but apropos on this one:It's pouring buckets of rain in DC. Do I want to go out and vote for the choices between theMaoists or the Stalinists on the ballot mostly for make believe positions like DC Senator or DC representative? Time will tell. The Panhandle votes that came in yesterday trimmed the Ds "early vote" lead in FL to just 22,000 (it was 94,000 in 2016 when Trump won by 113,000). So we are 72,000 ahead of 2016 already. Tom Bowler,yes we went up to Colebrook a few times when my parents lived there. One time we went during the daughter's February school vacation. We took her ice skating at the Balsams. Another time she stayed with her grandparents during summer vacation. It was very dry that summer and their well was dry. My father had a dowser come to find a new well. My mother still tells the story of the daughter following the dowser in total fascination. A good memory for a little kid. 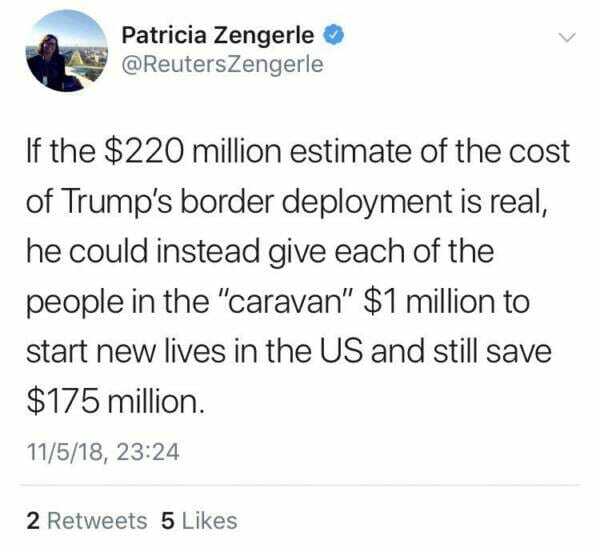 Reuters Reporter Urges US Government to Give Each Caravan Member $1 Million — And Save the US $175 Million! That'll work, Ext--next will be flooding the world with million dollar bills. And we'll make it up on volume! Yes and they are endorsed by the candidate who thought rothschilds had a weather machine, anyone same to vote for. In 2012, we had a reform slate down south the local machine wipe them out. On my pc I get an error that says http403 website requires you to sign in. I signed in to typepad and still get the error message. DEVELOPING: How much interaction has the Democratic National Committee's new CTO Raffi Krikorian had with his old employer Twitter in the run-up to the election? And how many Twitter engineers has he brought with him to the DNC? Anyone call for an emetic? Opinion | Evan McMullin: Americans must be prepared for Trump to escalate his authoritarianism post-midterms. There is no doubt in my mind that McMullin was working at the behest of John Brennan. VOTING SUPPRESSION, IRREGULARITIES, FRAUD, RECOUNTS!! On my pc I get an error that says https403 website requires you to sign in. I signed in to typepad and still get the error message. Pretty strange, since http://justoneminute.typepad.com doesn't require signing in. HTTP 403 is a standard HTTP status code communicated to clients by an HTTP server to indicate that the server understood the request, but will not fulfill it. There are a number of sub-status error codes that provide a more specific reason for responding with the 403 status code. Not quite stealth.. can't make quality turbines blades. Kind of the same problem as the steel they dump here, they make crap. No matter how they try to blame this on Trump, voting machines in Detroit are controlled by democrats. If Trump is truly an authoritarian and literally Hitler wouldn't the brave little Egg have to be making his claims anonymously through the French Mormon Underground? I’m sure they will blame the rain on Trump too. In fact, what website requires signing in just to get to the home page? I can't think of one. Not even banking or even secure federal gov't websites. They require signing in to get to the secure data, not to see the home page (with the login link). Just another typepad error. I'd try deleting cookies, since maybe you have one that Typepad doesn't like. There's a browser extension called Click & Clean that includes a cookie deleter. You can delete all cookies, or just the ones you want to delete. Might try deleting all Typepad cookies. Sara Carter's husband is a veteran who was permanently blinded in both eyes by a grenade in 2011. "You'll have to forgive Kellyanne and I. We're a little speechless because we're not used to friendly crowds." Such I good line that I'll suppress my inner grammar nazi. Voted around 8AM today. Every booth was occupied. I am hoping that this many new voters - over 10 million in early voting are motivated by Trump. On Chrome, I have deleted browsing history, cookies, caches, et. al. Doesn't solve the commenting issue. I have to fill out the comment form, albeit its easy but cannot retreive my photo avatar in my Typepad accounts profile. Same on Safari & FF. Is anyone on JOM able to use their personal Avatar (photo or image) stored in their Typepad account? Oh and there were no 18-24ers when I voted. ............ the sound of my vote dropping into the bucket holding R votes in Twin Cities. I predict the R's strike out in MN. I'm firmly on the ledge. I'm not holding out hoping to be pleasantly surprised. ......... plink. Missing from above. Four things to vote on this morning for me, definitely the shortest ballot I've ever seen. Governor, Senator, Congressman, State Rep, no initiatives or anything. I cleared cookies. Used ie and Firefox. Same error code. It's keeping me logged in on my (Windows 10) PC, using Chrome, both at work and at home. It will not log me in on my iPhone or my iPad, either in Safari or in Chrome. 403.1 - Execute access forbidden. 403.2 - Read access forbidden. 403.3 - Write access forbidden. 403.5 - SSL 128 required. 403.6 - IP address rejected. 403.7 - Client certificate required. 403.8 - Site access denied. 403.9 - Too many users. 403.12 - Mapper denied access. 403.13 - Client certificate revoked. 403.14 - Directory listing denied. 403.15 - Client Access Licenses exceeded. 403.16 - Client certificate is untrusted or invalid. 403.17 - Client certificate has expired or is not yet valid. 403.18 - Cannot execute request from that application pool. 403.19 - Cannot execute CGIs for the client in this application pool. 403.20 - Passport logon failed. 403.21 - Source access denied. 403.22 - Infinite depth is denied. 403.502 - Too many requests from the same client IP; Dynamic IP Restriction limit reached. I don't know enough to guess which ones are likely possibilities, but I guess a rejected IP address would be one. If you have dynamic IP, sometimes rebooting the modem will update your IP to a new one. before and after the reboot. I can go to Typepad's homepage and login, but I can't login to Typepad from here, which always worked in the past. I'm shocked that there is a lot of rental space in Crystal City. The buildings are run down and dated by now, but isn't the location still good? Big mess on the UWS. Long line in rain, 3 of 5 scanners are down. But people here are crazy. They’re determined to vote even with no races in any doubt. They replaced the old machines with scanners a few years ago. The machines never broke down. "403.5 - SSL 128 required." That shouldn't be 128, it should be 137. Not sure what I'm getting h/t'ed for. I can't fargin' login. Since we're already several threads beyond my willowed list of folks endorsed by Trump, I thought I'd post it again here, so that it's easily accessible on the first page for later reference. It was published by The Daily Caller. Laura Kelly, the D candidate for gov of Kansas, is the most un-inspiring candidate I have ever seen. She speaks horribly and can't look anyone in the eye. I’ve tried everything suggested here and from Typepad. I still can only post from my iPhone when it’s not connected to my WiFi. TM very kindly checked, and my IP isn’t blocked. I’ll continue to lurk and try posting from time to time. Thanks to all who are trying to solve this. I tried with another browser (which didn't have adblock), and got this ad in the sidebar. Too bad there's no matching pants. If Schiff is interested in continuing the collusion investigation, perhaps we ought to let him? NYT apparently ran an interesting story over the weekend. Probably it's all due to TypePad bugs. But I suppose it could be interaction with Goog/Twit/Facebook "stuff". Perhaps a minority of the paying customers use TP while others use the other methods. If so, the pressure on them to make a fix is less because a workaround exists. Just voted. It’s globull warming to beat the band here. Two inches already on the roads and an early, wet snow so few have their snow tires yet. Parking lot in front of the polling place (high school) was a mess. Lines were long. A friend of mine is running for the state legislature here as a Dem. Great guy and would probably do a good job. In the past I would have voted for him easily. Couldn’t do it this year. Just can’t bring myself to vote for any Democrat. That party has gone insane. It now says there is a problem with this websites security certificate. The security certificate presented by this website was issued for a different websites address. Security certificate problems may indicate an attempt to fool you or intercept any data you send to the server. When I say continue to this website it says this website declined to show this webpage. Http 403. Most likely cause this website requires you to login. The guy who's running as an independent against Fauxcahontas, claiming to be the "real Indian" and that he "invented e-mail", was married to Fran "The Nanny" Drescher for 2 years. He's probably going to do nothing more than hurt Geoff Diehl's chances of unseating Ms. Pow Wow Chow. Not your Latin phrase of the day. Stole it from Reddit. Also going to steal Stephanie's e deploribus Unum. No line when she went at 11:00, but her husband, who voted an hour before, had to wait in line. She was 288 on her scanner for today, but there had been 1040 votes cast, which indicates to me a lot of early voting. A favor - if you see something today and want to report it, include the link or quote the tweet/comment verbatim so we can find the source. Some tweets are state-specific or pertaining to a certain race, but that isn't always apparent from the tweet if it's part of a larger thread - so the full quote/link is good to have. ALSO DO NOT BELIEVE EARLY EXIT POLLS. This seems potentially helpful, Sue. Tried signing in with Twitter. Let's see if that worked. Almost an hour and a half wait in my heavy D neighborhood (although more Rs have arrived there in recent years). About the same as 2004 from my memory. I don't always vote at the same time, though, so it's not really that meaningful. Beto will win big here in Travis County as expected. However, per an TX EV analysis I saw a few days ago, big red counties were seeing an increase in turnout from 2016, big blue counties a decrease in turnout EXCEPT Travis. Hey, that worked. Yay! I'm out of Typhuspad prison. JMH, since DJT and DJT,Jr visited to stump for Claudia Tenney, she probably ought to be on the list. Don, Jr. visited last night. I can't find my avatar. If I log in, it just leaves my name and e-mail, it allows me to post as GUS, but no avatar. Buford, does the message above your comment box start with "You are currently signed in..."? Created an entirely new free typepad account, logge in successfully, no difference in here. Ex, no, it says "Comment below or sign in with" and gives me some options. And I have to type in my nmae and email every time. Marlene, We have a place on Big Diamond Pond which is not in Colebrook, but you really can't get there without going through Colebrook. It's a pretty little lake, and I wondered if you ever got to it on any of your visits. Love the Balsams, but it remains closed. The latest news I've heard is that the developers are giving up on the NH loan guarantees that they were seeking, and looking for financing elsewhere. Doesn't sound promising. One of the developers is Les Otten, who was behind the Sunday River Ski Resort development. He got into the Balsams because of the potential to expand the Balsams' Wilderness Ski area. I suppose there is still hope for it, but it looks bleak at the moment. Normally I don't link GatewayPundit, but this features the work of Michael E. Newton whom I've been following. Reminder: 2016 was a great year for GOP as they won the Presidency and 241 House seats. Doing better in #earlyvoting than 2016 was not expected based on the polls and the so-called experts on TV. Everytime I come here I am first presented with a black screen with the TM post on it. I have to swipe it to read the comments. "I’ve tried everything suggested here and from Typepad." Why don't you try posting something on the Home Away From Home thread at Quasiblog, which I have resuscitated in anticipation of TM switching over to sign-in only commenting. I really brought it back in your honor, so that if people get locked out, at least they have some place that they can let other JOMmers and /or TM know. If you can only post with your phone there too, you'll know your problem is not exclusive to one blog. For all we know, there may be others like you, right now and I encourage anyone who is locked out here, to try a test comment at Qblog. At the moment, I haven't enabled the sign-in feature, so it should be a pretty low bar. I can also pass along a message, if someone is locked out here, but not there. It's really more of a potential backstop, because most of the Typepad problems will persist until Typepad corrects them, but who knows for sure? Yikes, its like my gremlins have migrated to everybody else.